Rigid heddle loom weavers often have stashes of gorgeous knitting yarns laying around. If you need a quick present and want to weave a scarf from a ball of sock yarn, here is a quick method that requires almost no math. You must have a digital kitchen scale that weighs in grams. (This is one of the most valuable tools I own for knitting and weaving-make sure it weighs to the nearest gram, not the nearest even number of grams for the best accuracy). You probably need around 80-100 grams if you want to weave a decent scarf. Determine the appropriate sett for your yarn. For sock yarn used as both warp and weft I use a 10 dent heddle. If your sock yarn is especially thin, you may want a 12. Remember you want the scarf to be drapey, not stiff. The scarf shrinks when taken off the loom and the yarn blooms when wet finished. Begin by weighing your ball of yarn. You want to work with the actual weight, not what is stated on the ball band. Divide this number of grams in half and add 2 (3 if using a larger RH loom that has more loom waste than a Cricket). This is about how much you need for warp. Example 102 / 2 + 3 = 54 grams. Then 102-54 = 48. 48 grams is about what you need to reserve for weft. Make a ball of yarn that equals the amount needed for weft (the smaller number; in the example it is 48 grams). To do this, put the whole ball of yarn on the scale. Wind off yarn until the scale says the larger number needed for warp (in the example, 54 grams) what you have in the ball is the weft (in the example, 48 grams). Double check both balls before cutting yarn between. Set the smaller ball aside for weft (the example is 48 grams). Divide the larger ball of warp yarn in half by grams. Using the same method with the scale as you did above. (example 54/2=27 grams). Take one ball of the 2 balls of warp to your prepared loom. Decide how long to make your warp (remember to add loom waste to desired scarf length plus a couple of inches for take up and shrinkage). An 8 or 9 foot warp makes a nice long scarf. For a shorter scarf to tuck into a coat, you probably want 6.5 to 7 foot warp. Fasten the peg that far away. Find the center of your heddle and tie one of the warp balls to the apron rod behind the center. Warp your slots from the center out and stop when you run out of yarn or the scarf is more than half the width you would like. Tie off at the apron rod or the peg. Repeat with the second ball of warp, sleying the slots from the center out the other direction. Again, tie the end of the warp to the slot or the peg. Save 2 lengths of yarn for a repair in case a warp breaks. You can save one from this ball and one from the other. Wind on to the back, sley the holes and weave as usual. Remember in a balanced weave your Ends Per Inch or Dents per inch (e.p.i) = Picks Per Inch (p.p.i.) Look for squares of light between warp and weft. 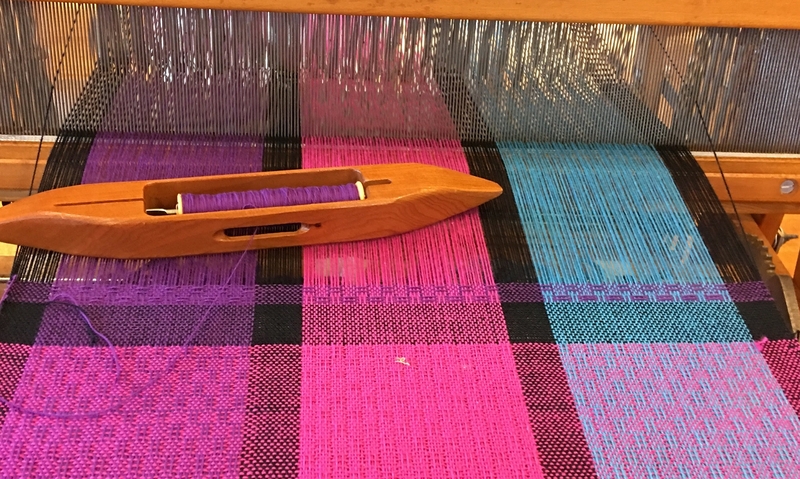 Do not beat your weft in too hard, use a light touch and place the weft with the heddle. Hopefully this method has reserved enough yarn to weave the scarf with little to none left over. You will never get it exact and you will have to be happy with the width you got with your balls of warp yarn. I am working on a little spreadsheet to do calculations for you if you want to figure out ahead of time how wide your scarf will be. I will post it when it is ready, so check back soon. I have a beautiful skein of yarn I bought at a local festival by Leading Men Fiber Arts that will be getting this treatment soon. It’s too gorgeously scrumptious to be socks! Thanks for sharing your method!